This guide was originally written for scriptinghelpers . The original can be found here . One of the most common requests I get for blog post topics are for a decoration placement system that saves. I’ve shied away from this topic in the past as there is no singular “correct” way to do it. That being said, I think it’s a good exercise for all game devs to go through and will potentially place a role in a future blog post I plan to write. All that being said, the question I still have not answered is “Why use OOP?”. My answer: I personally enjoy it as it forces me to organize my code in a modular and reusable way that can be combined together for a variety of complex tasks. That being said there’s positives and negatives for everything so use what works for you. Finally we can get into the purpose of this blog post! Before we even start about specifics let’s layout a few things we want our placement system to do. In this section we’ll mainly be focusing on the flat surface constraining part, but we’ll also want to take into account filtering enabled for some of this. As such our first step is going to be talking about that. Now I don’t know about you guys, but personally when I write FE friendly stuff I don’t like to repeat myself. Unfortunately that’s a rabbit hole that we can easily fall down. So the way I approach FE with OOP is to use the RunService:IsServer() method. This tells me if my code is being run on the server or on the client. If I bake that into my own class then when I run things I’ll be able to have both logic for client and server specific things. The only catch here is that I actually need two identical objects created by the class. One on the server, and another on the client. I’ll henceforth refer to these as twins. For the sake of this post here’s how I might setup the server handing and the class constructor. Moving onto methods, we’ll probably want at least two (we can always add more later). The first method, :CalcCanvas() will tell us the surface’s CFrame (rotation and center) and size (width and height). The :CalcPlacementCFrame() method will be used to find the model parameter’s constrained CFrame that is closest to the position parameter. The rotation pameter will allow us to adjust for when we wish to rotate our model by 90 degree increments. Let’s start filling these out shall we? Sure enough, if we try this out and draw out the CFrame in some way we’ll see that it matches the rotation, it’s placed in the center of the surface, and the lookVector is equivalent to the top-surface’s normal. Now before moving onto the :CalcPlacementCFrame() method let’s discuss a few assumptions we can make about the models we place. The biggest of these assumptions is that they will have a primary part which represents their bounding box. This part will likely be completely transparent and non-collidable, but those choices are up to you as the developer. Now that we have that out of the way let’s fill in the method. Now we have a basic working surface placement method. Let’s try testing it out. Right, so in my opinion getting objects to snap and constrain to a surface is the hardest part, but there’s still a few other things we have to do before our placement system is complete. The main thing we have still yet to cover is finalizing the object’s position and then locking it there. This is quite easy in our current form as all we have all the information, but we need to make sure we do the placement on the server. We’ll do this with a new method called :Place() which will fire a remote event to place the objects. You’ll hopefully notice from the above gif that everything looks pretty good with the exception that we can currently overlap objects. The way we will deal with this is by creating a method that checks if we can validly place the object down and then passing that into our :Place() method. Awesome we don’t have to worry about that overlap problem anymore! This is a minor addition and can be completely skipped, but for those who are interested about how we might use the other surfaces of a cube aside from the top this section is for you. Just keep in mind that all this can be just as easily achieved if you rotate the canvas part such that it’s top surface is facing where you want. To do this we return to our :CalcCanvas() method. 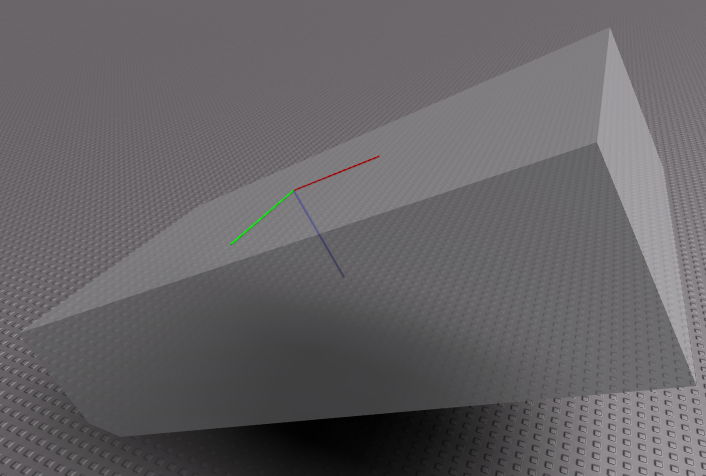 Before we used fixed object space vectors to represent the top surface CFrame. If we wanted to have this work for other surface we go through a similar process, but we need to do some actual calculations. We’ll now use the property Surface which will be a NormalId enum to represent the normal of the surface we want to calculate the CFrame for. Here’s that in action using the left surface instead of the top. To start off we need another remote function since the datastore only works on the server. We shouldn’t need to pass any data to the server aside from if we should save, clear, or load the data. This is because we already have a twin on the server that has the exact same information. Next, as alluded to in the code above we are going to define a new method called :Serialize(). This method will convert all the objects we have currently placed into a format that can be stored in a datastore. Since I just want to give a simple example we’ll do this by creating a dictionary where an object space CFrame is the key and the furniture item’s name is the value. That’s all for now folks, hopefully I’ll have another post soon! How to go about a placement system? Making a Placement System more efficient than what I have currently? How would I make a dragging system like in Roblox Studio? Very detailed explanation, thank you for this! Will be using this in my project. Always grateful to be apart of this community to allow myself to extend my experience in programming and to understand different components with examples from others. There are an overwhelming number of threads asking for guidance on placement systems or assistance in fixing their code. Not only does this tutorial adequately and smoothly cover how to make one, but it’s got the fancy OOP too. Well made. There’s one thing I noticed though. I didn’t take a critical look at this article since I have no use for placement systems yet, but your data saving code caught my eye. I wanted to ask - is there a reason that you save blank tables to clear data over using GlobalDataStore::RemoveAsync? Placement systems are something that so many people want to know how to make but they actually quite easy once you know how to actually make them. This tutorial will definitely be a great start for those that are trying to learn how to make such a system. To be honest no. I guess that was an oversight. It could/should be set to nil and no errors would be caused. Edit: So you can’t use :SetAsync() with a nil value. I also tried using :RemoveAsync() but keep getting warnings. So an empty table it shall stay for the time being. I use SetPrimaryPartCFrame() to do this, I find it simplier. The __index metamethod is “fired” when an existing key in a the table is indexed meaning read, not written. This is wrong. The metamethods are ran when the key indexed does not already exist. Yes I had a few ppl alert me to this (got things jumbled in my memory). Its fixed on SH, but im on mobile atm. Ill update the post when i next can. One of the best tutorials I’ve ever seen. Good job! Thank you for this! I think this is the perfect amount of work shown without giving away too much code including tweening the movement of parts as you move your mouse, rotation tweens, etc. You showed the basics and that leaves the rest of us to challenge ourselves to include more features. One of the few tutorials I will recommend to people frequently as too many people ask for this. Love the tutorial, but IsColliding always returns false. Thank you. This was a very good tutorial on placement system. As I am using this I noticed that when you rotate the model it’s not centered, how can I change it? Good question! The reason it’s not centered is because it’s locking to a grid. If you want the item to line up directly to the mouse then set the GridUnit equal to 0. Another behavior you might notice is that anything that isn’t a 90 degree increment may not be properly bound to the surface. This is because the code assumes axis aligned rotation and does some simpler math because of it. To fix this you must adjust how the model size is calculated (as a world space bounding box). Definitely keeping a note on this for future use. Awesome work! I see that the code only supports one specific part called “ExampleCanvas”, how would I be able to make the code support multiple parts? In case I want to have each player have their own canvas which they can place their furniture on. It’s entirely possible to do and quite easily extended onto the system provided. That being said, it’s something I leave for readers to figure out. Good luck! What part of the scripts would I need to edit to allow players to place items on different height surfaces? Currently can’t have placement on say a two storey building, etc. or different heights/levels of floors. If I understood the script right then I think that’s what you are looking for.